By admin in News on February 2, 2018 . As per the latest report, Supreme Court said that candidates who have not aadhar card can also apply for NEET 2018. These type of candidates can apply with voter Id, ration card, driving license, and bank account number. However, it will not be applicable for those who have filling the form from the states of Jammu & Kashmir, Assam and Meghalaya. The official notification has been released 0n 8th February 2018. Download Official Notification. Candidates can fill NEET Application form from 8th February, 2018 and the process will continued till 9th March 2018. The application form is available via only online mode. No offline mode is available for registration. If the applicants do not have an Aadhaar card, they can go to the CBSE facilitation centre which are set up in each examination city and apply for a new Aadhaar card. If the enrollment number facility is not available at the centre, applicants can enter the registration number issued by the centre in application form. 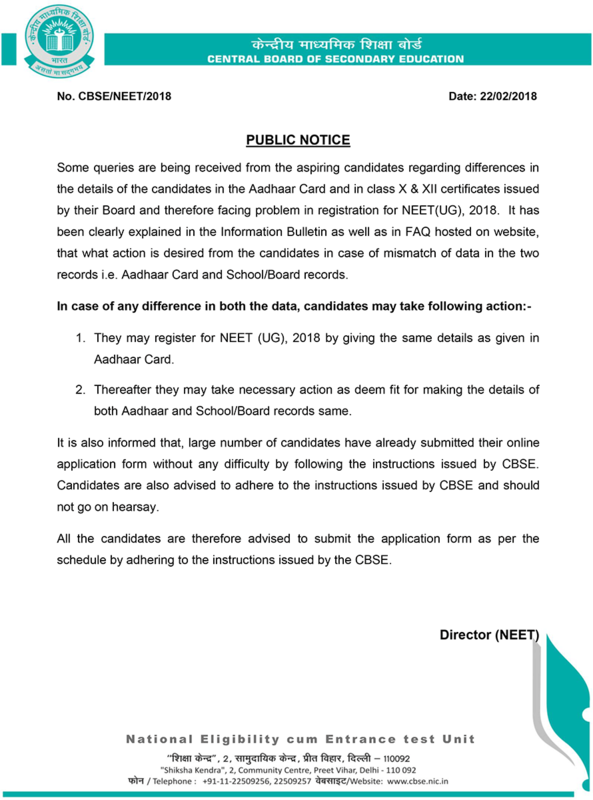 CBSE has clearly defined the advantage of using Aadhaar with the directives such as the use of Aadhaar for the NEET applications will result in accuracy of the details furnished by the applicants. According to officials, this will further help in ascertaining identity of the NEET applicants at the examination centres in a more convenient and hassle-free manner. The Aadhaar information also help to show only one identity instead of showing multiple documents. It specifies a Unique Identification Number(UIN) which is a unique number for each Indian Citizen. In past it is necessary to have a valid aadhar card to apply for NEET 2018 but now as per the supreme court it is necessary to apply for NEET 2018 that candidates must have aadhar card. 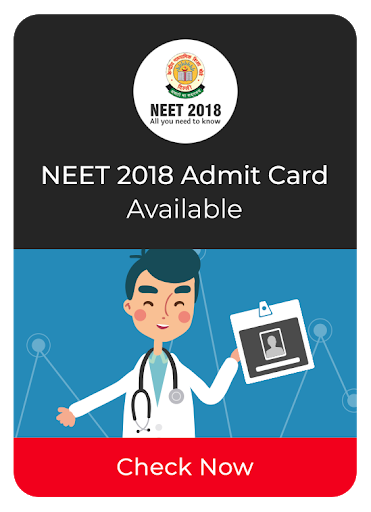 The applicants who want to appear for NEET 2018, they have to furnish their Unique Identification number(UID) while registered Application form. The board will validate the details of Candidate Aadhaar number with the government Aadhaar Database, if the details does not match then the applicants will not allowed to fill the form. Those applicants who are not enrolled for Aadhaar, it is required to register for Aadhaar enrollment, as entitled to obtain Aadhaar, as per section 3 of Aadhaar Act. Applicants are required to visit the Enrollment Center( available at www.uidai.gov.in) to enrolled their Aadhaar Number. Indian nationals belonging to all states: Candidate should have Aadhaar card or Aadhaar Enrollment/Registration Number issued by Aadhaar centre. Indian Nationals belonging to Andhra Pradesh, Telangana or Jammu & Kashmir: Aadhaar card or Enrollment/ Registration number issued by Aadhaar centre, Ration Card Number, Bank Account Number, Passport Number or any other Identity Card issued by the Government. Applicants who have their Aadhaar Card but the details are incorrect they need to submit a correction request at Aadhaar centre. They can apply for NEET Exam with the help of 14 digit enrollment number, which is issued by the adhaar center after the correction request.